Motorola has brushed aside concerns over the new Moto X phone's 'style over substance' hardware choices, claiming the device can still hold its own against the top smartphones anywhere on the planet. However, according to Motorola CEO Dennis Woodside, the quality of the "total user experience" enables the Moto X to match up to its market rivals. "We made some different choices from our competitors," he told AllThingsD regarding the presence of a dual-core, rather than quad-core, processor, and a 720p rather than full HD screen. "Where we chose to optimise, we are getting what we want out of the device," he said. Woodside questioned the merits of having a full HD, 1080p screen on a smartphone, claiming "Beyond 720p - unless you have the vision of a hawk - you aren't going to notice much of a difference." He also told the site the presence of a 4.7-inch screen rather than a 5-inch offering on handsets like the Galaxy S4 was chosen for user comfort. 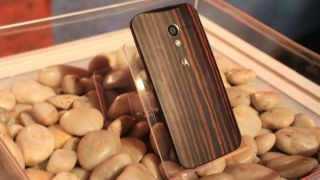 The launch of the Moto X has certainly opened a discussion about the merits of the spec-race in the smartphone world. Are smartphone users being duped into thinking they need octo-core processors and 3GB RAM when current tech is adequate for use in smartphones? Or, when forking out hundreds on new smartphones should they have more say over the look and feel of the device, rather than being restricted to identikit handsets?